More pictures from the Wedding Card...! So delighted, It's another Wedding! A B C, its your birthday today...! Laugh Out Loud! It's your Birthday! To all the great dads! A closer look on the cake! A precious quotation from the Scripture from 1Cor. 13 on LOVE was placed at the back of the card because there was not enough space left inside the card to put in messages. Behind the laced pieces are open pockets for slipping in "ang-pows" or gifts in the form of cash. Never tired of making another bouquet of flowers for someone for any occasion. Neither will anyone be tired of receiving another bouquet - anytime - to encourage or to cheer! Found this wardrobe template in Papercraft Inspirations Magazine and had such fun making it. Normally I would not enjoy making the same design twice but I am certain I will do another one again...soon...! Here's another wedding card to a special friend's daughter who loves purple. Purple color symbolizes sacredness and nobleness in the Old Testament time. It's a very elegant color & yet still preserves a lot of feminine qualities in it. The purple piece of cardstock was embossed & the pictures were stamped with Hero stamps & then colored with color pencils. 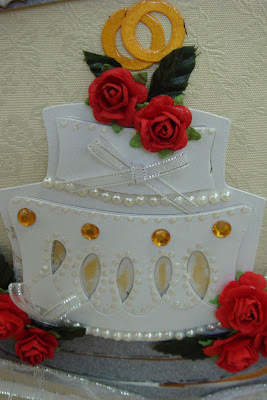 The piece of lace & glitter stones softened the whole look of the card. I love tea...any kind of tea...English or Chinese...as long as it is called tea...! It is with fond memories of my good old youthful days when I was like the beautiful rose next to the tea cup - blooming at its peak- and "bees" were zooming by armed with invitations for a cup or tea! How glorious then...!!! History: A friend had a few new-born "shi-shu" pups and he wanted to give us one. My son, Daniel was then terrified with dogs, so we decided to bring one home just to help him overcome some fear. It worked! Now, he is no longer afraid of dogs & may even play a few chase if in his mood! Lucy is very smart & almost human. We think she thinks she is a human, not a dog because she wants to eat the food that we lay on the table and is no way near liking any kind of dog food! She can even do quite a tricks for you if only you bring her some of her favorite food! We had such an adventure with this puppy, a pure breed spitz. One night on our way home, we almost ran over this a month old puppy! it was bitten by a huge dog on its back & had a huge missing piece with gruesome wounds with worms! We took it home, cared, nutured & loved it back to health! It was such a playful & destructive little thing it destroyed so many of my plants & Lucy was terrified of it that she no longer dared to venture into the backyard. Eventually we found out its original owner but it was too late, I gave it away to a friend at work! Hope it is happy in its new home! Though the time with Bessy was rather short, we are glad we saved a dog's life! I always find making a nice card for men a challenge! However when i came across this folded shirt pattern, I fell in love with it and ended up making 4 cards for this special day for dads! Happy fathers' day to all the wonderful dads of the world!